International Wine & Gourmet Basket - Designed for those with adventuring palates, this unique assortment of world-class food and wine is an impressive gift for both its variety and quality. 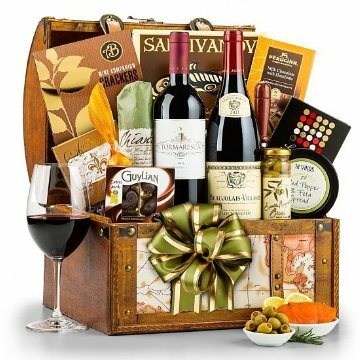 A stylish travel trunk showcases two exceptional wines: The wines are accompanied by a range of international gourmet favorites including Spanish Olives, Vino Rosso Dry Salami, Russian Landrin Hazelnut Truffles, a Chocolate Traveler Tin, Mt. Vikos Red Pepper & Feta Spread, and much more. Measures 14" x 11" x 12". Tormaresca Red Blend- Rich flavors such as black cherry and raspberrry dance with aromas of spice, sage, and wild berry. The wine is richly layered and well-balanced with an indulgent, lingering finish. From Southern Italy.